Bitter American is a “session ale” brewed by 21st Amendment in San Francisco, California. 21st Amendment is emerging from the receding glossary of American history, becoming a name recognized in more and more beer markets across North America. One of the things I love about 21st Amendment is their package design. Not only are they canning their beer, but they are paying special attention to the cans and boxes as an opportunity to be unique and artistic. Props to founders Nico Freccia and Shaun O’Sullivan for hiring package design artist Joe Wilson to do the illustration for 21st Amendment. The result is awesome. 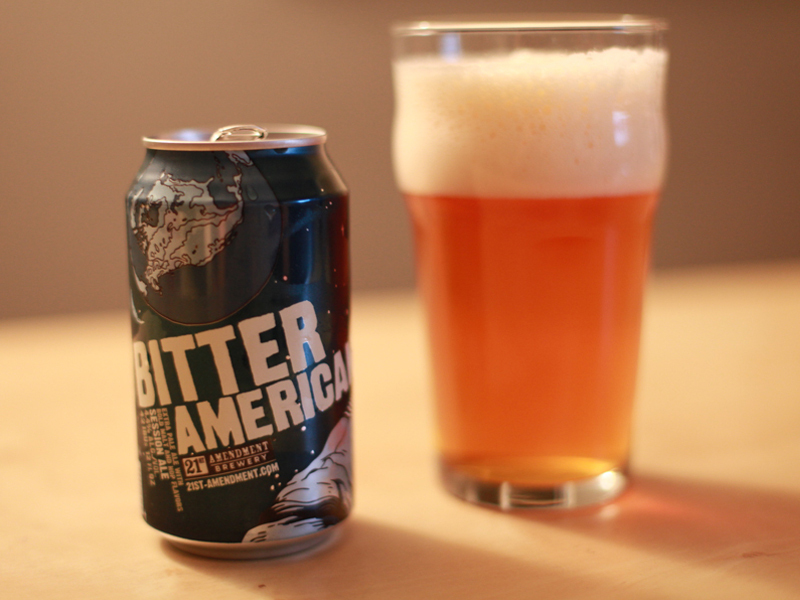 Bitter American is an “extra pale ale with bold malt and hop flavors” according to the can. The ABV is a surprising 4.4%, in that awesome range that, if tasty enough, will give you a beer you can drink a few of without its contributing too much to social blunders. That’s the idea with a “session ale” anyway: give us something we can spend an evening with, that has character but doesn’t lay us out. Session ales are great gateways for people hooked on adjunct macro brews like Budweiser and Miller. My can of Bitter American, with love from the bay, pours a nice clear copper color into my imperial pint glass. I pour it straight into the bottom of the glass, albeit slowly, so that a nice head can develop. People like to pour their beer differently, but the experts (brewers et al) all prefer this method because a well-developed head means bursting aroma. And the “nose” of a beer is critical to its enjoyment. After the first sip, I’m hooked. How can this beer be so low in alcohol and also so deep in taste? Fresh, juicy hops at the start of the sip, toasty malts in the middle, and a nice crisp bitterness at the finish. The hops used in this beer are Warrior (most often used as a bittering hop) and the all-American Cascade (often used at the very end of the boil to add aroma to a beer). The malts are Simpson’s Golden Promise (which is typically grown in Scotland), 2-Row Pale, Munich and Crystal. Honestly the malts play a pretty distant second chair in this beer, but hey … how else are they going to get those ABVs down? My thoughts exactly. Bitter American is a wonderful “session” ale with lots of bitterness, and not too much sweet. But it’s not lopsidedly bitter. Combined with it’s maker’s namesake, awesome packaging, I would say this is a beer I will really miss having (since they don’t distribute here in Chicago!) around the house. So, 21st, if you’re listening … come to Illinois! You’ve got fans! Excellent review. A brewery that I wish would soon come to Iowa.